Lynne Alvarez arrived in New York in 1977 planning to be a hot-shot poet who burned out brilliantly and died young. 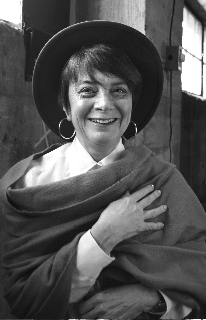 In the first matter, she won a CAPS grant for poetry in 1979 and served as Vice President of the board of directors for Poets & Writers for ten years. She did succeed in publishing much poetry, giving many readings and having two books published by Waterfront Press – THE DREAMING MAN (1981) and LIVING WITH NUMBERS (1986). She also became a member of PEN. But in the second matter- she continued to live, did not burn out but turned abruptly to playwriting in 1978. On a whim, Alvarez accompanied a friend to a gathering of Hispanic writers at Miriam Colon’s Puerto Rican Traveling Theater. At 31 she had never considered writing a play but she was now hooked. She wrote two plays under the auspices of this workshop, GRACIELA and THE GUITARRON which premiered at the St. Clements Theatre in 1983 and won her an NEA fellowship and entry into New Dramatists. It was first published in a TCG anthology ON NEW GROUND in 1986. Alvarez wrote several plays as a New Dramatist – including HIDDEN PARTS (1981) which won a Kesselring Award in 1983 and premiered at Primary Stages in 1987; THE WONDERFUL TOWER OF HUMBERT LAVOIGNET which won two awards, The Compte de Nouey Award for new plays in 1984 and a FDG/CBS award for best play, and later Best Production at Capital Repertory Theatre in Albany, NY in 1985. In 1984 The Actors’ Theatre of Louisvile commissioned a one act play which became the full-length THIN AIR: TALES FROM A REVOLUTION. Thin Air premiered at San Diego Repertory Theatre in 1987, and won a Drama League Award and a Rockefeller Fellowship in 1988. Two New York Foundation grants followed in 1994 and 1998, years in which she wrote three plays for ACT’s Young Conservatory in San Francisco: THE REINCARNATION OF JAIMIE BROWN, EDDIE/MUNDO/EDMUNDO and ANALIESE. All three opened there and were variously published in Smith & Kraus anthologies, BEST PLAYS BY WOMEN IN 1994, 1997, and 2001. Volume I of Alvarez’s collected plays was published by Smith & Kraus in 2000. The Lincoln Center Institute commissioned Alvarez to adapt …..AND NOW MIGUEL, produced in their 1995 season. The Repertory Theater of St. Louis also commissioned two children’s plays which they produced in 1991 and 1992 – RATS, a musical based on the Pied Piper of Hamlin and also an adaptation of RIKKI TIKKI TAVI, which was remounted in 2004. Alvarez was often commissioned as a translator of plays and poetry as well. In 1988, she translated Fernando Arrabal’s THE DAMSEL AND THE GORILLA, OR THE RED MADONNA for a 1988 production at INTAR. In 1990, she translated and adapted Tirso de Molina’s DON JUAN OF SEVILLE The Classic Stage Company’s production in New York City. She translated three plays by the great contemporary Mexican playwright Felipe Santander. These were published as a collection by Smith & Kraus in 2002. Primary Stages produced TWO MARRIAGES: ROMOLA & NIJINSKY Off-Broadway in 2003. For more information, please visit Broadway Play Publishing.